A California prionus beetle. Sounds sort of like a fuel-efficient car made jointly by Toyota and Volkswagen, doesn’t it? 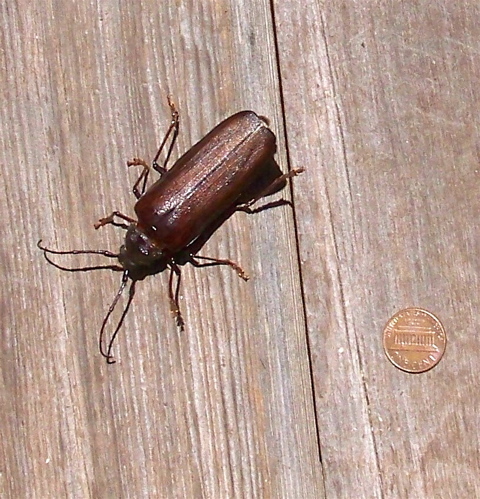 I found this huge beetle (more than two inches long) near my woodstove a couple of weeks ago, and Inverness Park biologist Russell Ridge identified it for me. The prionus beetle is usually described as a “boring insect,” not because it’s mundane but because its larvae feed on the roots of trees, often killing them. The larvae can reach four inches long and be as big around as your finger. Among the trees they attack are oaks, populars, black walnut, some fruit trees, and some conifers. Their range extends from Central California to Alaska. Western gray squirrels are common sights on this hill, but they disappear so fast when they see a human that it took me months of trying before I managed to photograph one. 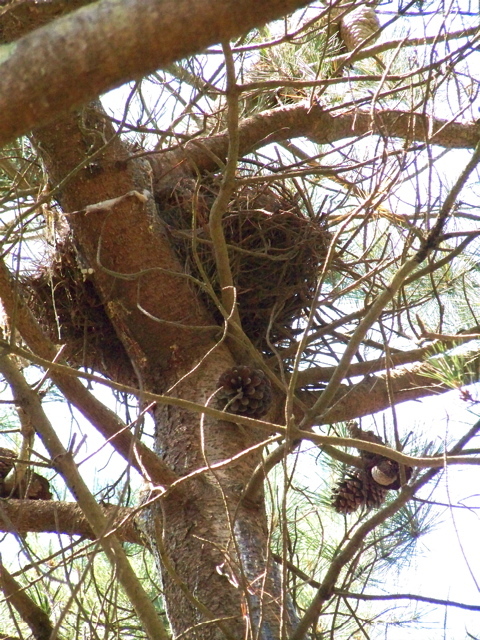 Except in stands of redwoods, gray squirrels can be found in trees throughout Marin County. This one is on my deck. 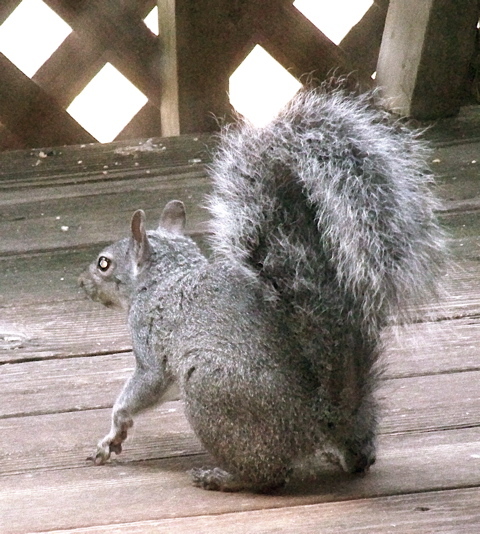 Gray squirrels breed in early spring and have a gestation period of approximately two months. Although females typically give birth in hollow trees or other hidden spots, they move their young into nests of leaves and twigs (called dreys) within a few days. Dreys such as this one on the property of neighbors George Stamoulis and Carol Waxman are often lined with grass or moss. In late fall and early winter, squirrels hide acorns in a variety of places to feed on during lean months. However, not all the hidden acorns are recovered, and gray squirrels are often credited with inadvertently planting oaks around the West. Young raccoons up a tree. These kits are about four months old, and every night their mother leads them on hunts around my cabin. Because I see them only after dark, I have to use a flash to photograph them. 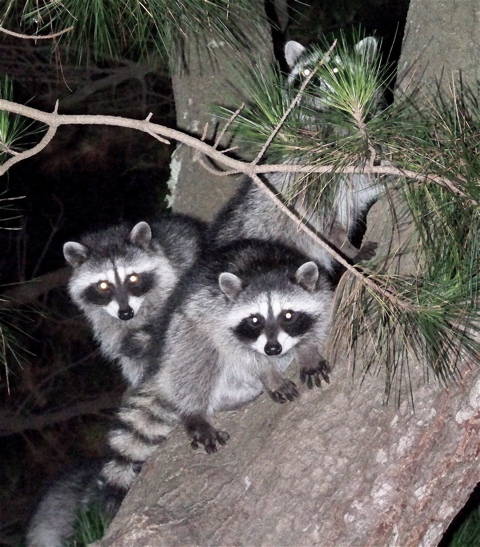 The raccoons don’t seem to notice the flashes, but my results nonetheless have been uneven. For most of my 35 years as a newspaper man, I shot photos with film, and I’m still learning the fine points of digital photography. In recent months, two problems in particular been been bugging me: white specks caused by shooting through windows and digital “noise” — tiny dots of color where there should be none. 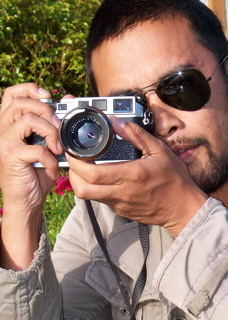 Fortunately, I’ve become friends with a San Francisco photography student, Jasper Sanidad (right), who contributes to The Point Reyes Light, and he is now my coach. For example, when I had been photographing nocturnal creatures, I’d usually tried to remain unseen behind closed windows, but Jasper noted that dirt on the windows was a large part of my problem. In addition, he told me, I’d been depending too much on my camera’s zoom to show the critters up close. Because my flash was too far from the animals, Jasper explained, my camera wasn’t picking up enough color detail, and the noise in my photos resulted from the digital system trying to provide what wasn’t there. What I needed to do, he added, was to get closer to the creatures myself and keep my zoom at a wide angle. That would eliminate the noise. As it’s turned out, Jasper was right, but what a surprise! I was able to shoot my nightly raccoons at close range, I discovered, mainly because they walked right in the kitchen door when I left it open to avoid shooting through the glass. Notwithstanding the crisp images I could get by having the raccoons so close at hand, I didn’t really want them in the house. So I threw some bread out the door, and they went back outside to get it. 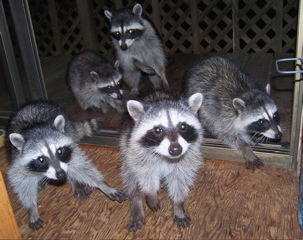 I can’t help but smile each time I see photographs of the raccoon invasion. But don’t use the wide angle when the bobcat comes a knockin’! The photos are wonderful, Dave, and whatever advice I’ve given only serves to exemplify what a keen eye you have. And thank you for all the knowledge you’ve imparted! You’ve been the true teacher. Sparsely Sage and Timely is powered by	WordPress 4.9.10 and delivered to you in 0.378 seconds using 52 queries.